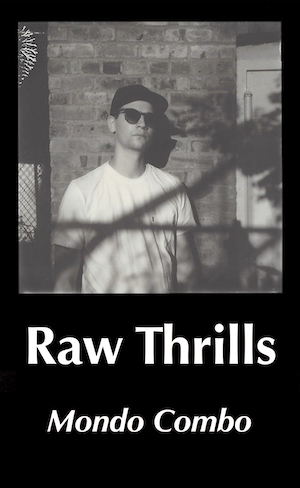 Winston Taylor Records is proud to announce the release of Raw Thrills’s Mondo Combo. Featuring appearances by guest artists, Mondo Combo’s layering of New Wave Theater-era experimentation with synth-driven post-punk continues the haunting character of Zak Mering’s multifaceted style of composition. Comprising covers of 80’s classics like Siouxsie and the Banshees’ “Hong Kong Garden” and Propaganda’s “Duel,” alongside exclusive original releases, Mondo Combo brings together an eclectic assortment of musical talent. Starting with the industrial flavored “Comin’ For Me” (featuring June Junior), Mondo Combo is decidedly a collaborative release. “I’m an Alien” (featuring James Ferraro) is a power pop gem where debauched guitar riffs and peregrine vocals create a funhouse atmosphere that slips the net of mainstream modes of production. Similarly, the sombre “Escape Pod” suggests the ambient familiarity of muzak laced with the passionate intensity of falling in love. Mondo Combo will be the first in a series of cassettes Winston Taylor Records will release over the next year. The tapes will provide a platform for established and emerging talents. Zak Mering (aka Raw Thrills) was born in Los Angeles and currently resides in New York. He comes from a family of musicians and entertainers, and has collaborated with Blood Orange, Outer Limits Recordings, and Weyes Blood, among others.